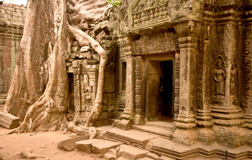 The holiday starts with a bang, discovering the awe inspiring ancient temples of Angkor Archaeological Park. 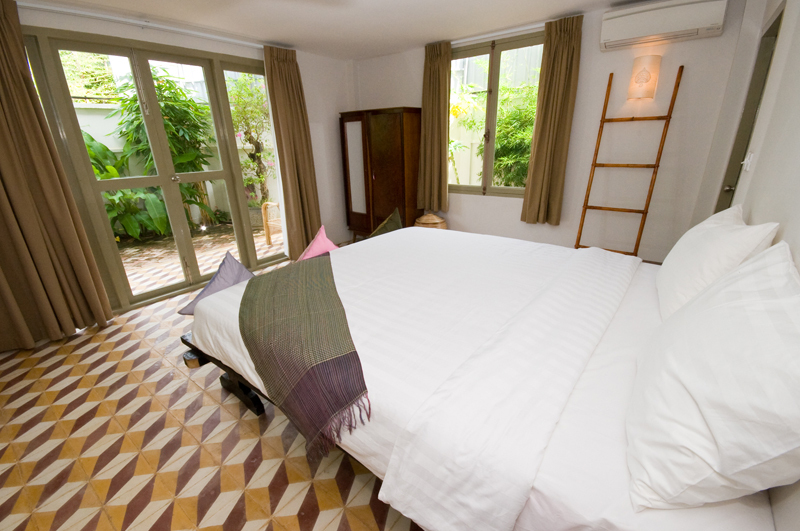 From here enjoy a jaunt into the beautiful countryside, overnighting in history-rich Battambang. Continue on to Phnom Penh, the evocative capital, where you explore Cambodia’s bloody history whilst raising a toast to an optimistic rebirth. Conclude the holiday on the coast, afloat the luxurious 4 Rivers Floating Lodge deep in mangrove forests and then soaking up the sunshine in a choice of beach resorts. Day 5: Private tour to Battambang for 1 night. 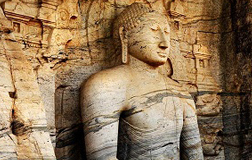 Countryside tour, hill top temples, "Killing Caves" & town. Day 6: Morning ride on Bamboo Railway and onward transfer to Phnom Penh for 2 nights. 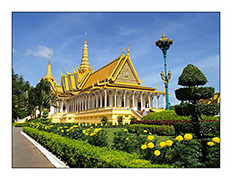 Day 7: Full day private guided Phnom Penh City Tour with Killing Fields. Lunch included. Day 8: Morning transfer to 4 Rivers Floating Lodge (2 nights) deep in the unspoilt south. Day 9: A full day to enjoy life floating on the river. Explore by kayak and visit the Tatai Waterfall. Day 10: Late morning transfer to Kep or Sihanoukville, Cambodia's premier seaside resorts for 4 nights. Days 11-13: 3 days to relax and enjoy your seaside setting. 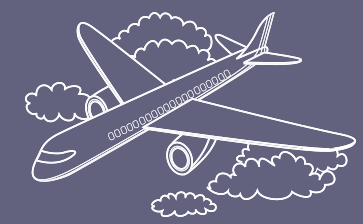 Day 14: Private transfer back up to Phnom Penh in time for your flight home. This morning your private guidewill collect you for the 2 hour drive to Battambang, famous for its French colonial architecture, rural scenes and the rubies and garnets mined in this province. En route visit Wat Phnom Banan, an 11th century temple built by King Jarvarman VII. 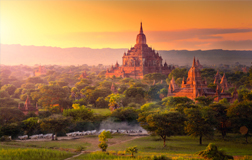 Located on top of a 400 metre high hill, the views from the temple are superb. 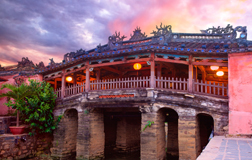 After lunch enjoy a walking tour of Battambang that will include visits to some of the old French Colonial buildings along the river, the former Governor’s residence, and Battambang Museum. Just 2 kms away from Battambang on the Sangker River is the village of Wat Kor. 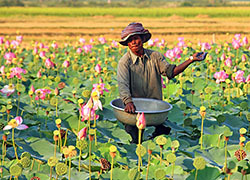 Here you will gain a fascinating insight into the Cambodian way of life in the province. Much of the town dates back to the early 20th century. Locals give visitors a short tour of the village and explain some of the history and show them around a traditional Khmer home. Check in to your choice of hotelfor 1 night. The evening is free to explore this small French colonial town. 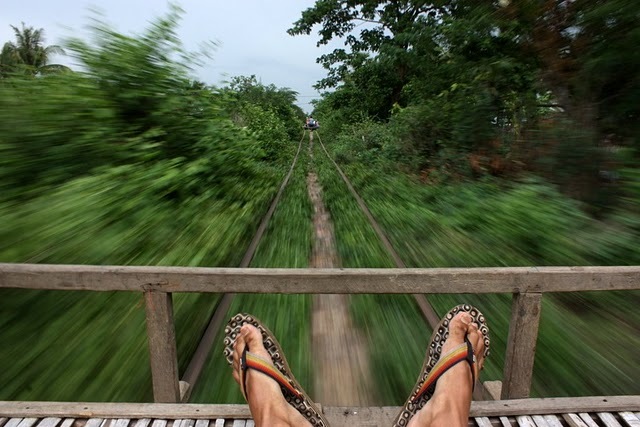 This morning you experience something very different: Battambang’s bamboo train. Strap a motorboat engine to a light metal frame with bamboo laths running lengthways and you have a bamboo train. An ingenious way of making the use of the single track you will be transported on a track that winds through beautiful countryside, twisting and dropping in every direction. If you meet someone coming the other way, the lightest has to be lifted off the track to allow the other through. A unique and memorable experience, although not a cultural high, it may still be one of you favourite holiday experiences. From here continue on towards Phnom Penh with lunch along the way. 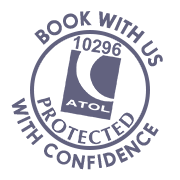 On arrival check into your choice of hotel for 2 nights.Evening free. This morning your driver will pick you up for a fascinating 5 hour drive down to the Koh Kong Conservation Corridor. Slowly leave the Capital behind and enter an undeveloped world of rolling hills, rivers and farming villages. 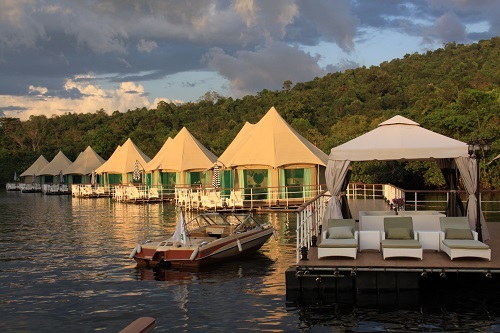 On arrival at Tatai enjoy a short boat transfer to the luxury 4 Rivers Floating Eco-Lodge. Eco-tourism has come a long way and 4 Rivers is a luxury, boutique resort that just happens to be floating on a beautiful river in one of the most unspoilt corners of Cambodia. In tune with its natural surrounding it offers a wonderful window into a disappearing world. This evening relax on the restaurant terrace, the prime position to watch the sun set over the river and sink into the mangrove forests. Dinner will be served at the wonderful restaurant that specialises in a fusion of Khmer and French cuisine. A full day to relax and enjoy this part of Eden. Perhaps kayak down the river with or without our experienced local guide, explore the mangrove waterways that reach back into the jungle, team up with some locals and try your hand at fishing for your supper. 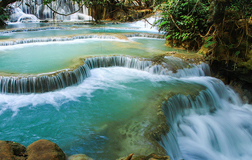 Join a boat excursion to Tatai Waterfall, Koh Kong Island or visit local markets in nearby villages. 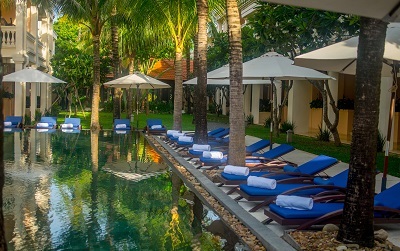 Maybe just enjoy a refreshing swim in the river and lounge on the terrace soaking up the tropical sunshine, before taking a long lunch. After dinner one of the most popular excursions is the short kayak adventure to watch the fireflies’ night time show. A final morning to enjoy life on the river before leaving for coast for 4 nights at your choice of resort. The drive along the coast is a joy, revealing the real rural Cambodia made up of sporadic villages, paddy fields and small farms. Your driver will be happy to stop for photos, answer any questions and help make the journey part of your holiday. Look out for children catching frogs with a fishing pole in the paddy fields or perhaps shrimps with a net. Others will be using the road to move their cattle or water buffalo from one field to the next. 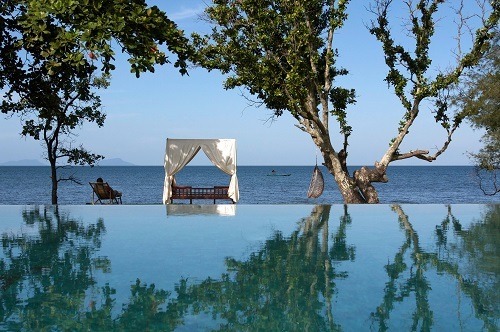 Kep is famed as a Khmer retreat whose offers an atmospheric stay by the sea, with authentically renovated hotels lining the shore and nestling in the hills to create a special feel. Except for a crab market and some simple restaurants there is little else here, but this is what adds to its allure. Developments will come soon, but for now it offers a rare backwater in this busy world. This is reflected by the people you meet in the hotels and town as there is a genuine warmth and openness that will make the most cynical smile. The town does not boast a classic beach but has off shore islands that are easily reached. If you would rather have great beaches on your doorstep we can include Sihanoukville just down the coast or Koh Rong Island. If you're staying in Sihanoukville or on Koh Rong Island 3 days to relax and enjoy your beachside setting. 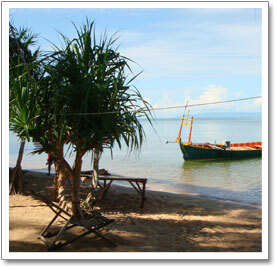 From Kep, for the best beach and a special place don’t miss a day out on Rabbit Island. Just 20 minutes away it boasts the traditional palm fringed beaches and is a great place to escape to for a day. For those who really want to get away from it we can arrange a romantic overnight stay in a simple bungalow by the beach. Don’t expect a pure white beach with azure sea and coral reef; what makes it special is that all the bungalows and restaurants are owned by an extended family that refuses to sell out to the big resorts. This creates a mini Shangri-la where the families live their life amongst you and are happy for you to become involved in perhaps a game of boules, fishing or Sey (Khmer keep-it-up game with adapted shuttlecock). If a shoal of fish is spotted then the boats are launched and the games forgotten. A beach resort that still revolves around real life not the tourist. 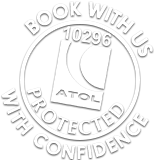 Morning free then afternoon airport transfer back to Phnom Penh in time for your overnight flight home.